Jim Leonhard It takes a certain kind of player to make it as a safety in the NFL. It's not that you have to have a screw loose, but you have to play with reckless abandon. Jim Leonhard shows you Exhibit A. 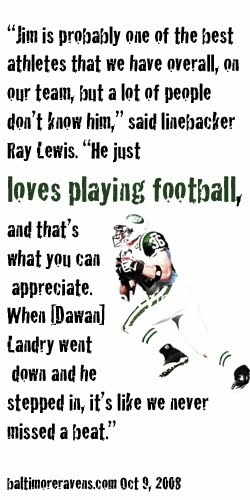 Head coach Rex Ryan took Leonhard from Baltimore when he went to the Jets, and it paid off on Sunday. Leonhard put a mean hit on Malcolm Floyd, knocking the ball loose. Leonhard lost his helmet on the hit, but that didn't stop him from diving for the loose ball. Then the play was reviewed and the call was reversed. 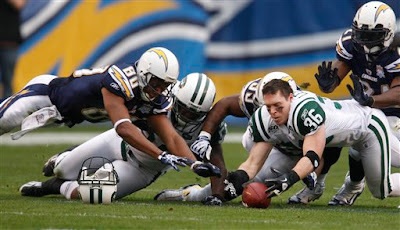 So the Jets didn't get the ball, but they eventually got the win. And we all now know how tough/crazy Mr. Leonhard can be.